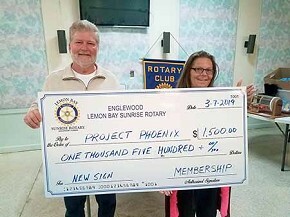 The Lemon Bay Sunrise Rotary Club recently made a $1,500 contribution to Project Phoenix to help them with a new sign at their new location, 36 W. Dearborn Street. 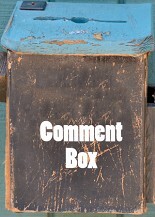 Project Phoenix is a 501(c)(3) not for profit organization whose main objective is to collect and distribute new and gently used household items to assist area families, and individuals, who are in need for a variety of reasons, and to help them make a fresh start and allow them to rebuild their households. Pictured here are Bill Stiver, President of the LBS Rotary Club and Bobbi Sue Burton, President of Project Phoenix.